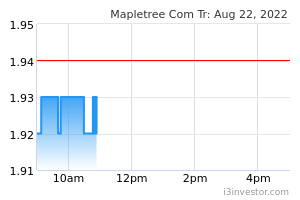 Mapletree Commercial Trust’s 3Q19 DPU of 2.33 Scts (+1.3% y-o-y) in line with expectations. VivoCity delivers again with 3Q19 NPI up 3.9% y-o-y. Earnings momentum to pick up following delivery of 5.9% positive rental reversion for 9M19. Full benefit from AEI at VivoCity yet to filter through; leveraged to upturn in office rents. We retain our BUY call on MAPLETREE COMMERCIAL TRUST (SGX:N2IU) with a revised Target Price of S$2.00. Mapletree Commercial Trust’s detractors believe that Mapletree Commercial Trust is due for a de-rating given the threat of e-commerce that can affect earnings at its key asset VivoCity. However, this ignores management’s ability to undertake asset enhancement initiatives (AEIs) to partially future-proof the mall against other competing malls and the online space. Evidence of this value-add was to achieve an ROI of over 10% from the AEIs and the bonus 24,000 sqft of GFA Mapletree Commercial Trust obtained by adding a library to the mall. We believe these proactive decisions will underpin the 2% DPU CAGR over the coming three years. Consensus’ Target Price of S$1.70 implies P/Bk of 1.15x which is too low considering Mapletree Commercial Trust owns two of the best in class retail and office/business park assets and VivoCity is only valued at a cap rate of 4.75%, higher than recent mall transactions at 2.6-4.2% for arguably less-dominant malls. As Mapletree Commercial Trust continues to demonstrate its ability to deliver consistent DPU growth, and the market prices in the scarcity premium of being one of only two 100% Singapore-focused large cap REITs, we believe Mapletree Commercial Trust will re-rate towards our street high Target Price of S$2.00, which implies a sub-5% yield that is consistent with other premium large cap office and retail REITs. We believe improving Singapore office rents and retail market should allay fears that Mapletree Commercial Trust does not have levers to counter the impact of higher interest rates and support a further re-rating in Mapletree Commercial Trust’s share price. To better reflect the scarcity premium and our target yield for other large cap retail/office REITs, we lowered our beta estimate and lifted our DCF-based Target Price to S$2.00 from S$1.80. A key risk to our positive view is a slowdown in retail sales affecting VivoCity’s ability to increase rents, and a slower-than-expected pick-up in office/business park rents. As expected, Mapletree Commercial Trust delivered a steady performance with 3Q19 DPU up 1.3% y-o-y to 2.33 Scts. This translated to 9M19 DPU of 6.83 Scts (+0.9%) which represents 75% of our FY18 DPU estimates. Underpinning 3Q19 results was the 2.6% and 2.2% y-o-y increase in 3Q19 revenue and NPI to S$112.5m and S$87.9m respectively as Mapletree Commercial Trust’s key asset VivoCity continued its robust performance. VivoCity maintained its robust financial performance with 3Q19 revenue and NPI up by 4.6% and 3.9% y-o-y to S$55.4m and S$42.0m respectively. The uplift in earnings was largely attributed to slightly better occupancy (99.9% versus 98.2% in 3Q18) and impact of prior quarter’s positive rental reversions. On that front, VivoCity delivered 4.0% rental reversions for 9M19, slightly down from 4.1% in 1Q19 and better than 2.1% reported for 1H19. Nevertheless, the uplift in signing rents has been stronger this financial year, with an increase of 1.5% recorded for the whole of FY18. Meanwhile, 3Q19 foot traffic and tenant sales were down 1.4% and 2.1% y-o-y respectively. We understand the weakness in tenant sales was due to “rigorous management of tenant mix” which resulted in some units temporarily being closed as new tenants moved in. For the first half of calendar 2019, tenant sales may remain soft as FairPrice takes over from Giant supermarket. While the decline in tenant sales may cause disappointment among some investors, we believe the deliberate attempt to curate the right mix of tenants, will lengthen the runway for growth at VivoCity. Mapletree Commercial Trust’s office and business park portfolio also delivered a healthy set of results with Mapletree Commercial Trust’s other main asset Mapletree Business City I (MBC I) delivering 2.4% and 3.2% y-o-y increase in underlying 3Q19 revenue and NPI (stripping out S$1m in one-off pre-termination income in 3Q18). Including the one-off income, 3Q19 revenue and NPI for MBC I would have both fallen by 0.8% y-o-y. The property continues to benefit from inbuilt rental escalations and actual occupancy increasing to 97.5% from 93.3%. Committed occupancy remains high at 98.4% marginally higher than 97.8% reported in 2Q19. The Bank of America Merrill Lynch Harbour Front (MLHF) building also had a very strong quarter, with 3Q19 NPI jumping 8.9% y-o-y to S$4.0m as the building is now fully occupied versus 91.6% occupancy in 3Q18. Likewise, Mapletree Anson benefited from higher physical occupancy of 96.9% versus 92.9% at end 3Q18 which translated to 2.9% y-o-y increase in NPI to S$6.8m. Going forward, with committed occupancy now at 99.0%, we expect better earnings momentum ahead. PSA Building (PSAB) reported steady performance with 3Q19 NPI at S$9.1m (+0.3% y-o-y) as prior negative rental reversions offset higher occupancy (96.1% versus 94.0% in 3Q18). However, we expect PSAB to report an improvement in income going forward as we understand Mapletree Commercial Trust was able to renegotiate a healthy increase in rents for a major tenant in the building. This renewal contributed to office/business park portfolio reporting 10.3% positive rental reversion (8.7% including rent reviews) for 9M19, versus 5.1% decline in 1H19. Post the renewals completed over the quarter, only 0.5% of office leases are set to expire in the remainder of FY19, with another 5.1% of leases due in FY20. Gearing remains stable at 34.8% with borrowing costs increasing to 2.95% from 2.93% in 2Q19 and 2.73% in 3Q18. The proportion of fixed rate debt was lifted to 79.7% from 75.2% at end 2Q18. We believe Mapletree Commercial Trust is the Fort Knox of REITs holding the “gold” or “crown jewels” in the form of VivoCity and MBC I, the best in class retail and office/business park assets. Furthermore, to better reflect Mapletree Commercial Trust’s scarcity premium as one of only two large cap REITs with a pure Singapore focus, we lowered our beta assumption to 0.725 from 0.80 (comparable with 0.70-0.75 beta we use for large cap office/commercial REITs) which results in our DCF-based Target Price increasing to S$2.00 from 80 previously. Our new Target Price implies a forward Target Price yield of 4.7% which we believe is more consistent with our target yield for other large cap office (CAPITALAND COMMERCIAL TRUST (SGX:C61U) & KEPPEL REIT (SGX:K71U)) and retail (CAPITALAND MALL TRUST (SGX:C38U)) REITs of 4.3-4.4% and 4.7% respectively. While we anticipate some push back from some investors given the P/Bk of 1.35x implied by our revised Target Price of S$2.00, we believe the experience with the large industrial REITs - ASCENDAS REAL ESTATE INV TRUST (SGX:A17U) and MAPLETREE INDUSTRIAL TRUST (SGX:ME8U) - are instructive as discussed in the next point. Ascendas REIT and Mapletree Industrial Trust, both similar to Mapletree Commercial Trust as they have demonstrated a consistent delivery of DPU growth as well as the ability to identify and acquire DPU accretive assets, have consistently traded around the 1.3-1.4x P/Bk level. Thus, we believe Mapletree Commercial Trust should also be accorded a premium rating, given its track record and its status of holding two of the best in class assets in Singapore. In the midst of the current macro uncertainty, we believe Mapletree Commercial Trust provides a safe harbour given its track record of delivering DPU growth. In addition, over the coming year, we expect earnings momentum to improve as we have yet to see the full benefits from the recent AEI and bonus GFA at VivoCity, strong rental reversions, as well as the impact from an upturn in spot office rents.